In 1-gallon food-storage plastic bag, mix granulated sugar and cinnamon. Separate dough into biscuits. Cut each biscuit into quarters. Shake in bag to coat; place in pan. In small bowl, mix melted butter and brown sugar; pour over biscuit pieces. Bake 35 to 40 minutes or until golden brown. Cool 5 minutes. Turn upside down onto heatproof plate; remove pan. Serve warm. Substitute 2 (9x5-inch) loaf pans for the fluted tube cake pan. Divide the biscuits and butter mixture evenly between the loaf pans. Bake as directed. 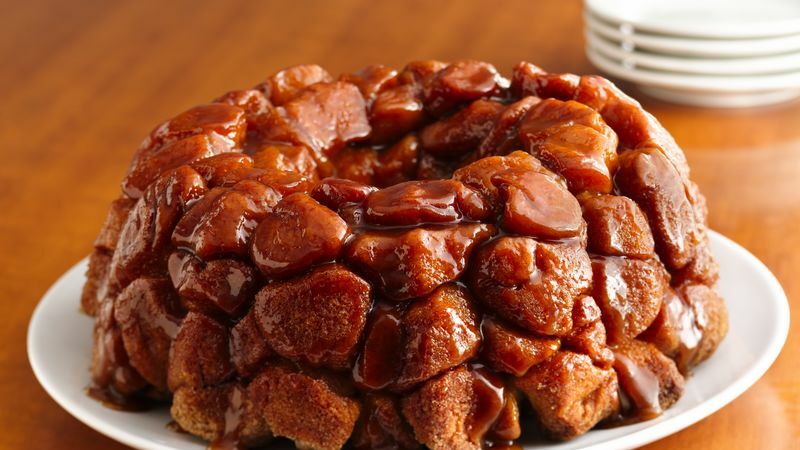 Finally, the simple caramel monkey bread you’ve been looking for! We’ve put together this recipe using only five ingredients. This sweet treat is the perfect addition to your special weekend breakfast, bursting with warm that cinnamon and brown sugar flavor we know and love. Why use biscuit dough? Our biscuit dough is easy to coat and bake in a Bundt plan, plus saves you the trouble of making dough from scratch. Also, it’s super easy to pull apart when it’s finished baking—no knife required! Monkey bread’s roots trace back to a traditional Hungarian recipe, arany galuska, which means “golden dumplings.” The treat consisted of balls of yeast dough dipped in melted butter, then in sugar and frequently mixed with cinnamon and/or chopped nuts. Looking for more variety? From savory breakfast options, like our Bacon, Egg and Cheese Monkey Bread, to the sweet Nutella Strawberry Mini Monkey Breads, there’s a monkey bread recipe for everyone.